There once was a time when the options in mainstream Kid’s clothes consisted of little more than uniforms and hand-me-downs. With exception of families who were very wealthy, children’s outfits used to be about one thing – practicality. Well, those times are no more. These days Kid’s clothes range from the stylish to the avant-garde. There are designer labels, high-quality garments, and trend-setting outfits in miniature sizes. And the best part is, they’re now accessible to the masses, with prices that everyone can afford. Whether it be bohemian chic, skater cool, grunge-rock or smart and sharp, there are kid’s clothes for every style, occasion and price tag. Let’s be clear about one thing – as good as we want our kids to look, they still need to be kids. Letting them climb a tree, scrape a knee, hug a dog and play outside are all important parts of clothing needs for a child. So what options are there if you want your child to look good, but still be themselves? The answer is, plenty. Fashion stores are doing a fantastic job of expanding their ranges of comfortable, fashionable clothes to include children. And the best part is, much of it is versatile. You can get stylish jeans and skirts that can go to the park or out for dinner. Smart sneakers run from outside to inside. Knitted jumpers and cool street hoodies can keep them warm or be peeled off without being worried about it getting lost. Something to keep in mind when buying kid’s clothes is the fact that they’re still growing. You don’t want to buy an expensive item, only to have your child grow out of it in a matter of weeks. But equally, you don’t want their clothes to be swimming on them either. 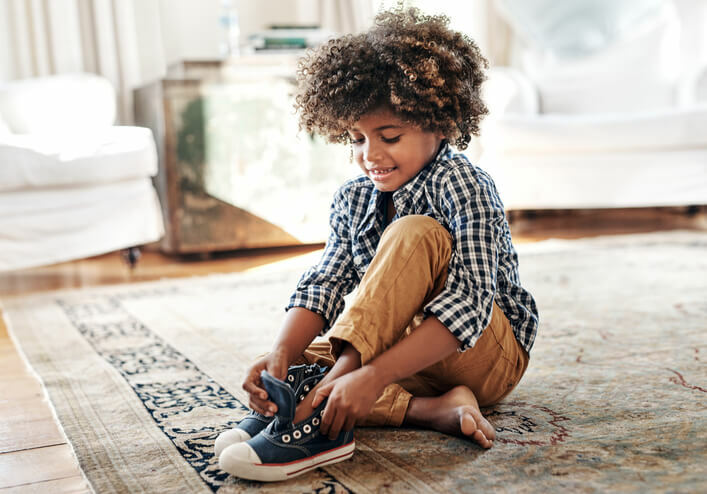 The key is balancing some high-quality items that will last them a while, with a range of basics that a growing boy or girl can churn through as quickly as needed. Think along the lines of fitted t-shirts with jackets that allow a bit of breathing room. Another important development in Kid’s clothes is that it is no longer overly prescriptive on the gender front. What does this mean? There was a time when little girls had to ‘look’ like little girls in dresses and skirts, hosiery, pink frills and white lace. Meanwhile, the little boys all looked like mini-professors, wearing brown trousers, black suspenders and blue and white collared shirts. These days, girls and boys are much more free to dress as they choose. As if to prove this point, a number of major brands stock unisex lines of clothing. Girls can wear blue jeans and black collared shirts, and boys can wear pink and yellow t-shirts if that’s what they wish. And we’re all the happier for it. If you’re looking for children’s clothing that is high in quality, stylish, and will let your kid be free to be who she or he is, look no further than Zalando Lounge, the shopping club of Zalando. Zalando Lounge’s members get access to all the top brands at incredibly low prices. You’ll find new sales and promotions every day, giving you exclusive access to high-quality Kid’s clothes, with discounts up to 75%*.